Home theater rooms are an increasingly common amenity in new homes and also older homes that are being remodeled to adopt this modern design trend. Ingesting media has become part of our DNA, so it’s natural that you want to create a comfortable home theater room (or man cave) for an optimal cinematic experience when watching your favorite movie, sports team, or even streaming music through your Smart TV. Learn how to soundproof a home theater room through the use of our lab-tested soundproof acoustic curtains. If you have the luxury of building a new home from the ground-up, it makes sense to plan for a basement home theater room, which will yield optimal sound control given that the cement foundation has natural soundproofing qualities. When a basement home theater is not possible or if you’re adding one to your existing home, you may consider creating a room inside of a room if you have the space. This means installing between two and four new walls in a large, existing room and leaving a six- to 10-inch gap between them and the existing walls. Additional soundproofing for your home theater room can be achieved through double stacked drywall in the “room inside a room” concept. Gaps can also be filled with noise-isolating materials. But how do you control the noise that travels around and through windows and doors in an existing room? The most simple and effective way to soundproof a home theater room is by installing soundproof acoustical curtains to reduce reverberation and echo, as well as reduce interference from outside noise. Enter: Quiet Curtains! Use Quiet Curtains to cover windows and doorways or use as room dividers, which may be necessary in a split-purpose home theater/media room. Wondering why Quiet Curtains are so effective? Our acoustical curtains and drapes are designed with powerful, lab-tested inner linings that do the work in both residential and commercial environments. In fact, our STC 20 Quiet Curtains reduce noise by 20 decibels! For reference, that means the increase in decibel level from 10dB to 20dB is about 4 times as loud, which is a significant difference. Reducing noise by 20 decibels will help achieve your goals when figuring out how to soundproof a home theater or man cave. If looks are also important (and they always are), explore our fabric galleries or send us your own for a truly custom look. 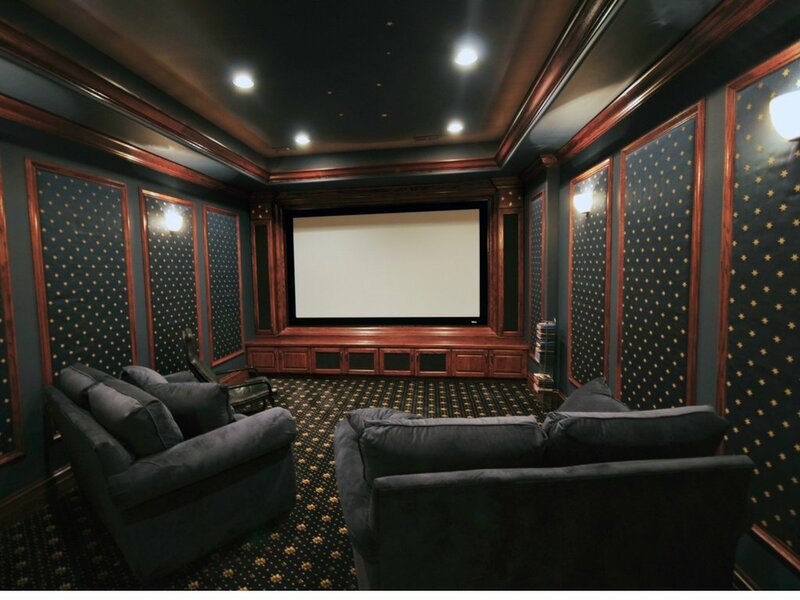 When you invest in Quiet Curtains to soundproof your home theater room, man cave, or basement home theater, you will get the results you need to create the most dynamic media experience possible. Call us today so we can answer any questions and get you started with the right sound blocking and dampening curtains for your home theater. Call toll free (866) 560-6411 today!